As seen in the finale of the fourth series of Doctor Who, this 12" radio controlled Supreme Dalek comes with motorised Dalek movement, flashing lights and speech, automated head and eye movement, poseable gun and arm and illuminated eye. As fans of Character Option toys have come to expect, the attention to detail on this 12" model is as impressive as ever. This means that, once again, this won't only be welcomed by new, young Doctor Who fans, who want to drive this around the house exterminating anything that moves, but it will also find a welcome place on old fans and collector's shelves. The remote control unit not only allows you to steer the Dalek where you want it to go (apart from up or down stairs, obviously) but it also comes with five buttons. 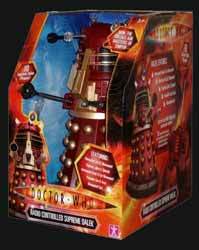 The first four are each assigned to the ten phrases the toy emits, while the fifth button produces a cry of "Exterminate" followed by the sound of a Dalek gun firing. The only possible negative remark I have is that, for the majority of casual Who fans, there are already a number of remote control Daleks on the market and to be honest, unless you are an avid collector, one is enough. 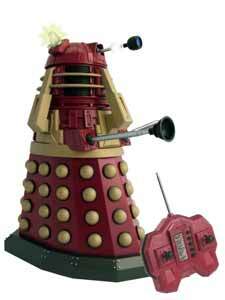 If you already own one remote control Dalek do you really need another?